© 2004 By Kathleen Kemsley. Originally published in Women On Wheels Magazine, May/June 2004. The joy of movement, the thrill of discovering new places, the fun of meeting people: these are the usual high points cited in motorcycle travel narratives. One picks up a bike journey book expecting to be spirited along on the writer’s good-time route. 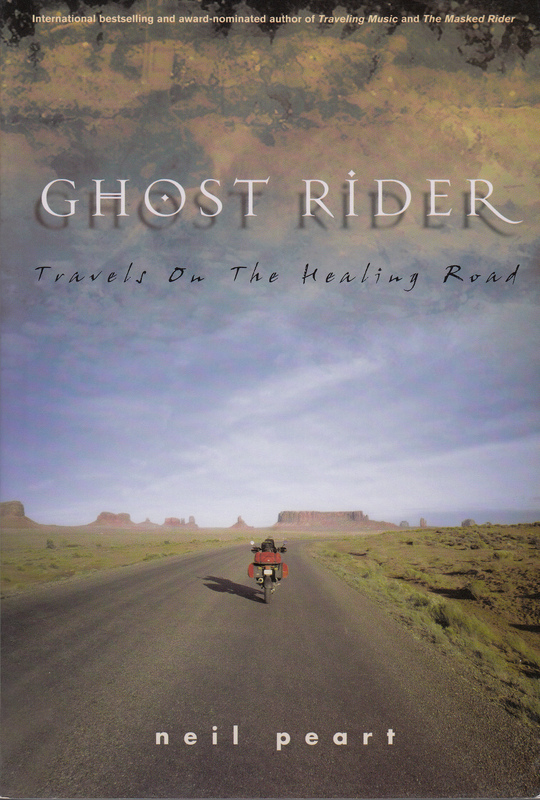 In the case of Ghost Rider: Travels on the Healing Road, nothing could be further from the truth. Author Neil Peart’s journey crisscrossing 55,000 miles of North and Central America is neither joyful, thrilling, nor fun. Instead, the trip serves as therapy, allowing Peart to begin recovering from staggering tragedy. The deaths within one year of his wife and his 19-year-old daughter, along with the incarceration of his best friend, render Neil Peart shell-shocked and devoid of hope. The only decision he can manage is to keep moving, a Ghost Rider on a BMW. Covering 400 to 600 miles per day, Peart escapes into manic forward motion, all the while searching the wreckage of his heart for some meaning. “My mission now was to protect a certain essence inside of me, a sputtering life force, a meager spirit,” Peart writes at the beginning of his journey. With a poetic yet unsentimental vision, Peart relates an absorbing narrative about a two-wheeled quest to repair his damaged soul. Peart’s first inkling of a return to the living comes almost 100 pages into the book. On a twisty highway in British Columbia, “the sky remained bright, the air cool and delicious, and the sinuous road coming toward me was so challenging and rewarding that I was tempted into the adrenalin zone.” He finds himself whooping with an exhilaration not felt in many months, and his ride on the Healing Road has begun. Despite the author’s melancholy state of mind through much of his journey, he nevertheless manages to write engagingly about the history of such places as Owens Lake, California. Long hikes taken in national parks from Glacier to Zion to Yosemite are well-drawn, alongside un-self-conscious descriptions of inner struggles with the pain of memory and loss. As the drummer and lyricist for the rock band Rush, Peart knows many musicians and artists throughout North America. Time spent nurturing these friendships along the way bolsters Peart’s attempts to rejoin the human race. Some of the book is straight narrative, while other sections take the form of excerpted letters to friends. In between three rides of several months each, Peart returns to his home in Quebec, Canada. “Curiosity keeps me going. If not hope. That seems to be gone, with idealism and faith. No more illusions. It just is. Deal with it,” he writes. Acceptance comes gradually, but readers will be cheering for Peart as he emerges from his soul’s dark night. Both the tragedies and the triumphs of Peart’s life-affirming journey are expertly depicted in this book. The Ghost Rider’s path back to the land of the living should not be missed. Whitehorse Press, 2002, 458 pages, $19.95.